Genzler is proud to announce the addition of the MAGELLAN 350-BA10-COMBO to the line of compact, high powered bass amplifiers and cabinet. 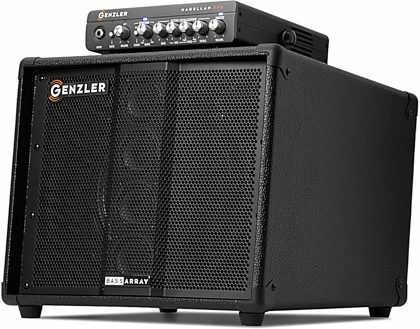 They've configured the MG-350 amplifier with the Bass Array 10-2 cabinet to be offered as an extremely small combo rig that delivers big output and tone. The combo "kit" allows the mounting of the MG-350 amplifier to the BA10-2 cabinet using the "hidden" MG-350-CRADLE, which can be mounted to the top surface of the cabinet using provided mounting screws in each cabinet. This allows easy install or removal of the amp to the cabinet for even more flexibility with this powerful little combo. The MG-350 delivers 175 watts as the combo and with an additional BA10-2 extension cabinet puts out 350 watts into this remarkable "mini-stack". The BA10-2 cabinet design blends the punch and quickness of a single premium Neodymium 10" driver in a vented bass reflex enclosure, along with the performance and pattern control of a proprietary line array element utilizing 4 custom designed 2.5" neodymium drivers. The benefits of combining both design platforms in an extremely compact cabinet are exponential for the player requiring such a small, yet powerful enclosure. This model also offers a unique cabinet shape with an angled baffle tilting up towards the player and a single top/rear mounted edge-lift handle for an easy grab and go solution. - One: Premium Eminence neodymium 10” cast frame loudspeaker. - Four: Proprietary neodymium 2.5” mid/high cone drivers with sealed basket design. Two – Combination Speakon NL-2 and ¼” input jacks. Custom, curved perforated metal grille with a unique center “pleat” to protect the array column.